If you want more Battleblock Theater you're going to have to make it yourselves. BattleBlock Theater is the latest game from The Behemoth, a developer most famous for the excellent beat 'em up Castle Crashers. 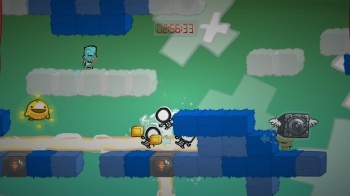 Unlike Behemoth's previous title, BattleBlock Theater focuses less on stabbing hordes of enemies and more on platforming and simple puzzle solving. Moreover the game also includes surprisingly fleshed-out level creation tools - and this is where you come in. See, The Behemoth knows that the game's longevity depends on expanding its extant content. That said, the company also knows how much work that would entail. So, they want you to expand the game for them. Actually, it's not quite as sinister as it sounds. In a new blog post, The Behemoth simply notifies players that if they're willing to follow a simple set of rules and are capable of creating really excellent, creative levels for BattleBlock Theater, that their project might earn a spot in the game's core content. You've played Furbottom's Features in BattleBlock Theater and now you want to create your own levels for the world to see. Perfect! The hours you'll toil away at making a fantastic playlist will not go unseen. Currently, Furbottom's Features showcases our level designer's playlist, but future Furbottom's Features will include user playlists! The best of the best playlists will be chosen and featured in either the Story mode or Arena mode! Great, right? Before you get too excited though, keep in mind that there are some rules that go along with this. A full list of requirements can be found on The Behemoth's blog, but they mostly consist of ensuring you have the proper number of levels in your playlist. Once that's sorted, properly label the playlist and upload it to BattleBlock Theater. From there The Behemoth will pore over your creation and select the finest efforts to include within the main thrust of the game. Whatever you might think of BattleBlock Theater, that's a very clever scheme. This way the game sees new content, thus extending its potential lifespan, yet developer The Behemoth doesn't have to put in too much effort, saving both time and development resources that could otherwise be better employed elsewhere. Plus, as a bonus, players get to feel like they're an important part of the community. This is a win-win situation for everyone.